Like its two siblings, the Peugeot Partner (shown) has an indicator that lights up when 80 percent and 100 percent of the payload is reached. PSA Group is about to introduce a new compact commercial van for its Peugeot, Citroen and Opel/Vauxhall brands. The vans will be made in the same factories in Spain and Portugal and have the same dimensions. They have many of the same features and options. How to keep them straight in buyers’ minds? The differences are subtle, and in many cases are a matter of wording. The Peugeot Partner, Citroen Berlingo and Opel/Vauxhall Combo will come in two lengths -- Citroen designates them as “medium,” 4400mm long with a 2780mm wheelbase, and “XL,” 4750mm long with a 2970mm wheelbase. Opel calls its sizes “short” and “XL," while Peugeot calls them “standard" and “long." Each will come in several versions, adapted to general tasks. 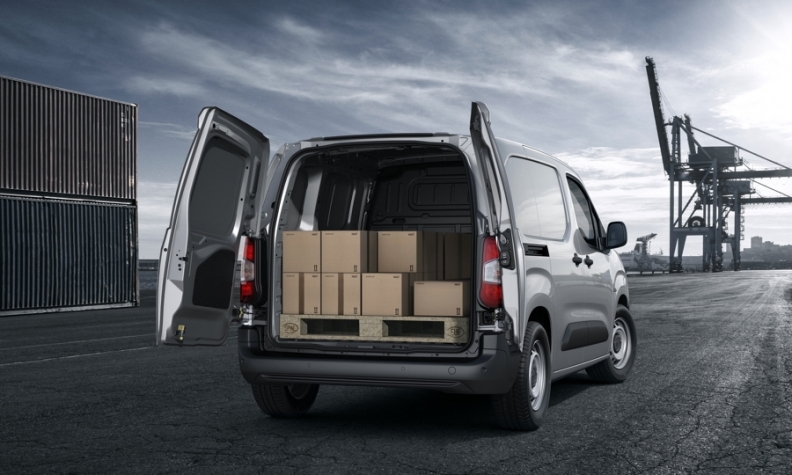 For example, the Berlingo “Worker” is for those who transport equipment and people, with 30mm additional ground clearance, larger payload, enhanced traction control, an engine skid plate and three-abreast front seating. The “Driver” Berlingo is for long days in the driver’s seat, emphasizing ride comfort and driver aids. Other options typical for the segment include sliding doors or no rear doors -- and PSA will work with third-party converters to satisfy customers’ needs. All three vans share a new indicator that lights up when 80 percent and 100 percent of the payload is reached. Another first for PSA vans is a surround view rear-facing camera system. One camera is located on the passenger-side rearview mirror; the other is above the rear cargo doors. Each van has its own grille, styled to match the rest of the range. The Berlingo incorporates Citroen’s full-width chevron, while the Opel -- the first Combo designed under PSA ownership; the previous version was a Fiat collaboration -- has horizontal chrome bars flanking the brand logo. Inside is where the differences are most readily apparent. Peugeot touts the Partner's I-Cockpit, first seen on the 2012 208 subcompact, which has a small steering wheel that doesn’t block the instrument panel. The Partner is perhaps the most technology-packed of the three vans -- Peugeot says it can be ordered with driver assistance levels equal to that of the best-selling 3008 crossover. Citroen says the Berlingo is motivated by “practicality,” and it retains a more conventional cockpit, as does the Combo. However, individuality is not the main driver of the LCV market. Analysts say buyers are motivated by usefulness, by ownership cost and resale value. So the most important facts and figures about PSA’s new vans might be those shared between dealers and buyers. These market forces are a big reason why so many vans are cross-developed and manufactured. Automakers want the profits from the van market, but many make the decision that it isn’t worth developing and producing their own. For instance, Opel’s vans were made with Fiat (previous-generation Combo) and Renault (midsize Vivaro and large Movano). PSA has already said the next-generation Vivaro will be a PSA product, and the Movano will likely follow suit.